MSR TrailShot MicroFilter. Clean water all day—without the weight. That’s the advantage the TrailShot Microfilter provides. Designed to hide in stash pockets and deploy quickly, this tiny water filter lets you drink directly from sources along the trail for instant hydration, and fill your vessels with clean water. 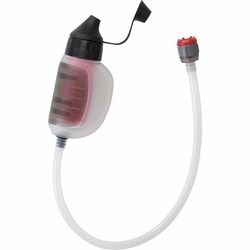 Easy one-handed operation filters one liter in a mere 60 seconds, so you can get back on the trail quickly and moving again. At just 142 g (5 oz. ), the TrailShot water filter is the ultimate filter for fast-paced, high-mileage adventurers, like trail runners, hikers, fast-packers and mountain bikers.